Order the US edition , the UK edition , or in the meantime enjoy the following excerpt. The defeated squadron was locked in its deceleration burn, the blazing fury of its torches directed toward the capital at Zanshaa. Bombardment of Delhi groaned and shuddered under the strain of over three gravities. At times the shaking and shivering was so violent that the woman called Caroline Sula wondered if the damaged cruiser would hold together. After so many brutal days of deceleration, she didn’t much care if it did or not. Sula was no stranger to the hardships of pulling hard gee. She had been aboard the Dauntless under Captain Lord Richard Li when, a little over two months ago, it had joined the Home Fleet on a furious series of accelerations that eventually flung it through a course of wormhole gates toward the enemy lying in wait at Magaria. The enemy had been ready for them, and Sula was the sole survivor of the crew of the Dauntless. Delhi, the heavy cruiser that had pulled Sula’s pinnace out of the wreckage of defeat, had been so badly damaged that it was a minor miracle it survived the battle at all. All six survivors of the squadron were low on ammunition, and would be useless in the event of a fight. They had to decelerate, dock with the ring station at Zanshaa, take on fresh supplies of missiles and antimatter fuel, then commence yet another series of accelerations to give them the velocity necessary to avoid destruction should an enemy arrive. That meant even more months of standing up under three or four or more gravities, months in which Sula would experience the equivalent of a large, full-grown man sitting on her chest. The deceleration alarm rang, the ship gave a series of long, prolonged groans, and Sula gasped with relief as the invisible man squatting on her rose and walked away. Dinner time, a whole hour at a wonderfully liberating 0.6 gravities, time to stretch her ligaments and fight the painful knots in her muscles After that, she’d have to stand a watch in Auxiliary Command, which was the only place she could stand a watch now that Command was destroyed, along with Delhi’s captain and a pair of lieutenants. Weariness dragged at her eyelids, at her heart. Sula released the webs that held her to the acceleration couch and rose to her feet, suddenly light-headed as her heart tried to make yet another adjustment to her blood pressure. She wrenched off her helmet– she was required to spend times of acceleration in a pressure suit– and took a breath of air that wasn’t completely saturated by her own stink. She rolled her head on her neck and felt her vertebrae crackle, and then peeled off the medicinal patch behind her ear, the one that fed her drugs that better enabled her to stand high gravities. She wondered if she had time for a shower, and decided she did. The others were finishing dinner when, in a clean pair of borrowed coveralls, Sula approached the officers’ table, sticking another med patch behind her ear. The officers now ate in the enlisted galley, their own wardroom having been destroyed; and because their private stocks of food and liquor had also been blown to bits they shared the enlisted fare. As the steward brought her dinner, Sula observed that it consisted entirely of flat food, which is what happened to anything thrown in an oven and then subjected to five hours’ constant deceleration at three gravities. Sula inhaled the stale aroma of a flattened, highly compressed vegetable casserole, then washed the first bite down with a flat beverage– the steward knew to serve her water instead of the wine or beer that were the usual dinner drink of the officer class. Lieutenant Lord Jeremy Foote was in the chair opposite her, his immaculate viridian-green uniform tunic a testament to the industry of his servants. This was a libel, since probably Foote didn’t enjoy living in his own stench any more than she did, but her words caused the acting captain to suppress a grin. Sula’s heart gave a little sideways lurch at the mention of Martinez’ name, and she hoped her reaction hadn’t showed. She was in the process of composing a reply when the acting captain, Morgen, interrupted. Sula didn’t know why this revelation was supposed to be embarrassing: Lord Gareth Martinez was one of the few heroes the war had produced, at least on the loyalist side, and unlike most of the others was still in the realm of the living. That one hit: she saw a twitch in Foote’s eyelid. Again the acting captain suppressed a smile. “Well, I hope you’re saying good things about us,” he said. “There’s still censorship?” Sula was surprised by the inanity of it. “Doesn’t Foote have better things to do?” They crewed a wrecked cruiser, with most of its officers dead, few of its weapons functioning, and the forward third of the ship a half-melted ruin, torn open to the vacuum of space. Surely one of the few remaining officers could find better use for his time than poking into her correspondence. Morgen lowered his voice, as if encouraging Sula not to spread this news to the enlisted personnel who knew it perfectly well. “We have to prevent panic from spreading in the civilian population,” he said. Sula felt her lips quirk in amusement. “As my lord wishes,” she said. Probably Morgen’s relations were going to do well out of this, too. Sula’s relations would not, for the simple reason that she didn’t have any. She was in the nearly unprecedented position of being a Peer without any money or influence. Though the title of Lady Sula made her the theoretical head of the entire Sula Clan, there was no Sula Clan, no property, and no money save for a modest trust fund that had been set up by some friends of the late Lord Sula. She had only got into the Fleet because her position as a Peer gave her automatic place in one of the academies. She had no patron either in the service or outside it. Deplorable though it was, her position nevertheless gave her a unique insight into how the Peers actually worked. The alien Shaa, who had bloodily conquered the Terrans and the Naxids and the other species who made up the empire, had created the order of Peers as an intermediary between themselves and the great mass of their subjects. Now that last of the Shaa was dead, the Peers were in charge– and had managed to land crash into a civil war within bare months of their last overlord’s demise. Sula was surprised it had taken them that long. So far as she could tell, the Peers acted exactly as one might expect from a class who had a near-monopoly on power, their fingers in every profitable business, and who with their clients owned nearly everything. The only check on their rapacity was the Legion of Diligence, who would massacre anyone whose avarice became too uninhibited– as, in fact, they had massacred the last Lord and Lady Sula. The Peers, Sula observed, seemed to act out of naked self-interest. But for some reason it was impolite to actually say so. Sula finished her flat food, then called a chronometer onto her sleeve display and wondered if she had enough time to look at her mail before suiting up to stand her watch. She decided she had enough time. Sula returned to her cabin, one that had originally belonged to a petty officer who had been killed at Magaria, and which still contained most of his belongings. She snapped on the video display with her right thumb, an action that caused a sudden sharp sting. She snatched her hand away, and as the display flashed on she inspected the thick scar tissue on the pad of her thumb. After the battle, in the course of conducting urgent repairs, her thumb had come into contact with a pipe of superheated coolant, and though the wound had healed, a wrong movement could still send pain shrieking along the length of her arm. She tucked the thumb carefully into her palm and paged through menus with her index finger until she found her mail. Only one message, from Lieutenant-Captain Lord Gareth Martinez, three days in transit via powerful communications lasers. She opened the message. “Well, Corona managed to bungle another exercise,” he said wearily. His broad-shouldered figure was slumped in a chair– he, like Sula, had been suffering from many days of high gee, and his weariness showed it. His viridian uniform tunic was unbuttoned at the throat. He had a lantern jaw, thick brows, and olive skin; his provincial accent was thick enough to send razor blades skating up Sula’s nerves. When they had first met, before the war, they had come together briefly, then came explosively apart. It was all Sula’s fault, she felt: she’d been too panicked, too paranoid, too far out of her depth. She’d spent the next several months hiding from him. A conceited son of privilege like Foote was someone she could cope with; Martinez was something else again. If they were lucky enough to come together once more, she wasn’t going to let them blow apart ever again. Meanwhile, in another part of the universe . . .
A few hours later came a signal from Do-faq that the heavy squadron was ceasing acceleration temporarily, as the captain of Judge Solomon had suffered a cerebral hemorrhage as a result of constant high accelerations. It was the sort of thing that could happen even to young recruits in the peak of physical condition, and Martinez was thankful that no one had yet stroked out aboard Corona. In wartime there was very little that could be done for the luckless captain: he’d be taken to sick bay and given drugs and treatment, but acceleration would have to be resumed before long and it was very likely that Judge Solomon’s captain would die or suffer crippling disability. Thus it was that a day and a half later, when Corona and the light squadron leaped through Wormhole One into the Hone-bar system, it was twenty minutes ahead of Do-faq’s eight ships. The message sent to the Fleet Control Board had not arrived on Zanshaa as yet, and Martinez was still exercising command. The Hone-bar system seemed normal. The system was peaceful, loyalists were in charge of the government, and there seemed no immediate enemy threat. Civilian traffic was light, and the only ship in the vicinity was the cargo vessel Clan Chen, outward bound through Wormhole One at .4 c .
The Hone-bar system even had a warship, a heavy cruiser that was undergoing refit on the ring, but the refit wouldn’t be completed for at least another month, and until then the cruiser was just another detail. Martinez had no plans to go anywhere near Hone-bar itself. Instead he’d plotted a complex series of passes by Hone-bar’s primary and by three gas-giants, the effect of which would be to whip the squadron around the system and shoot it back out Hone-bar Wormhole One at top speed. The crew was at combat stations, as was standard for wormhole transit in times of unrest. Martinez’ acceleration cage creaked as the engines ignited, driving Corona on a long arc that would take it into the gravitational field of the first of the system’s gas giants. He fought the gravities that began to pile on his bones, and tried to think of something pleasant. Caroline Sula, he thought. Her pale, translucent complexion. The mischievous turn of her mouth. The brilliant emerald green of her eyes . . .
Martinez fought to take another breath. Oh dear, he thought. Here’s trouble. Martinez looked in wild fascination at the ten enemy engine flares registered on the display, and took an extra half-second to make certain that his voice was calm when he spoke. Martinez returned to calculating trajectories. As Wormholes One and Two were 4.2 light-hours apart, the Naxids had actually entered the system slightly over four hours ago, and were decelerating as if they intended to stay in the Hone-bar system. It was impossible to be precise about their current location, but it appeared they were heading slightly away from Martinez’ force, intending to swing around Hone-bar’s sun and slingshot around toward the planet. They would, in time, see Martinez’ squadron enter hot, with blazing engine flares and pounding radars, and know the new arrivals for enemies. Martinez’ squadron wasn’t heading for Hone-bar either, but rather for a gas giant named Soq, on a trajectory that would hurl them toward the system’s sun, on screaming curves around three more gas giants, and then back through Wormhole One again and on to Zanshaa. 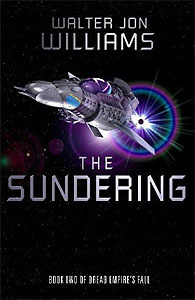 They were heading for the sun at a much more acute angle than the Naxids, and if neither changed course Martinez would cross his enemy’s trail on the far side of the sun. But that wouldn’t happen. The Naxids would pass behind the sun and swing toward Hone-bar and the squadron, and then antimatter would blaze out in the emptiness of space and a great many people would die. Gradually, as he studied the displays, Martinez realized that his message had not been repeated back to him. “Oh! Sorry, lord elcap. Repeat, please?” Shankaracharya’s communications cage was behind Martinez, so Martinez couldn’t see him, only hear his voice over his helmet earphones. Corona couldn’t communicate directly with Do-faq, not with the wormhole in the way, but there were manned relay stations on either side of the wormhole, all equipped with powerful communications lasers. The stations transmitted news, instructions, and data through the wormholes, and strung the empire together with their webs of coherent light. The low-gravity warning blared out, the engines suddenly cut out and Martinez floated free in his straps. His ribs and breastbone crackled as he took a long, deliberate free breath. He saw Vonderheydte at the weapons board casting him a look, and then Mabumba at the engine control station. Mabumba was one of the original crew who had helped Martinez steal Corona from the Naxid mutineers. So were Tracy and Clarke, the sensor operators. Navigator Trainee Diem– now promoted Navigator/2nd– sat where he had during the escape, and so did the pilot, Eruken. Both had been joined by trainees. Cadet Kelly, who had acted as weapons officer in the flight from the Naxids, had been returned to her original job of pinnace pilot, and was presumably now sitting in Pinnace Number One, ready to be fired into action. Vonderheydte had replaced her in the weapons cage, again with a trainee to assist, and Shankaracharya had taken Vonderheydte’s original place as communications officer, backed up by Signaler Trainee Mattson. These were the most reliable personnel he had aboard, along with Master Engineer Maheshwari in the engine department, another veteran of Corona’s earlier adventures. Martinez regretted extremely the fact that Kelly wasn’t a part of his Control staff. He didn’t relish her chances in what was to come– only one pinnace pilot had survived Magaria, and that had been Sula. It wasn’t just Kelly he’d have to look after, though, it was all of them. And not just the personnel aboard Corona, but the other ships in his squadron. And then it occurred to him that many of Corona’s people didn’t yet know they were about to engage the enemy, only those here in Control and presumably those with Dalkeith in Auxiliary Control. He had better tell them. “Comm: general announcement to the ship’s personnel,” he said, and waited for the flashing light on his displays that indicated he was speaking live throughout the ship. He paused, and wondered where to go from here. At this point a brilliant commander would, of course, inflame his men with a flood of dazzling rhetoric, inspiring them to feats of courage and radiant daring. A less than brilliant commander would make an address of the sort Martinez was about to deliver. He made a note to himself that, if he survived the coming fight, he’d assemble a stock of these sorts of speeches in case he ever needed one again. He glanced over the control room crew and saw what he hoped was increased confidence. He decided to follow with unabashed flattery. “I know that you are all eager to come to grips with the enemy,” he continued. “We’ve trained very hard for this moment, and I have every confidence that you’ll do your duty to the utmost. From the reaction of the control room crew– the chins lifted in pride, the glitter of determination in their eyes– Martinez thought he’d done well. He decided to quit while he was ahead and ended the transmission. That left only the enemy to deal with. He looked again at the display, ran a few calculations from current trajectories. Corona’s squadron, after a month’s acceleration, was traveling just in excess of a fifth of the speed of light. The Naxids were faster, coming on at .41 c . They could stand higher accelerations than the Lai-owns of Do-faq’s heavy squadron, or perhaps they’d been in transit for a longer amount of time. And then Martinez realized what the enemy squadron was, and what they were doing here, and the entire Naxid strategy dropped into his mind like a ripe fruit fallen from the tree. These ten enemy ships were the squadron that had originally been based at the remote station of Comador, and were heavy cruisers under a Senior Squadron Commander named Kreeku. On the day of the rebellion, they’d simply left Comador’s ring station and burned for the center of the empire. It had been assumed they were heading for the Second Fleet base at Magaria, but the Comador squadron hadn’t taken part in the battle there. The Fleet had assumed this was because they hadn’t arrived yet, but perhaps they’d always been intended to go someplace else. Any ship traveling from the empire’s core to the Hone Reach had to travel through Hone-bar’s Wormhole Three– if another route existed, it hadn’t been discovered. Kreeku had all along been intended to cut the Hone Reach off from any loyalists and secure it for the Naxids. Martinez told his display to go virtual, and the Hone-bar system expanded in his skull, all cool emptiness with a few dots here and there representing Hone-bar’s sun and its planets, the wormhole gates and little speeding color-coded icons with course and velocity attached. Since the arrival of the Naxids the merchant vessel Lord Chen had increased its acceleration and was fleeing the system as fast as the bones of its crew could stand. Martinez could confidently assume that the Naxids, who would not know of Martinez’ arrival for another four hours, would continue their course toward Hone-bar’s sun, and by now would have traveled a little short of two light-hours’ distance. They would travel an equal distance before they would see Martinez’ engine flares, and then their blissful ignorance would end. There would be many hours after that for the battle to develop, and it would pass through a series of obvious stages.. Martinez should begin decelerating and let Do-faq’s eight heavier ships enter the system and join him. Do-faq could then confront the enemy with sixteen ships to the Naxids’ ten, and engage on favorable terms. With the loyalists swinging around Soq, and the Naxids coming around Hone-bar’s sun, the two squadrons would be meeting each other almost head-on, in one of those blazing collisions that Martinez had seen in records from the Battle of Magaria. At the end of which a few loyalist survivors would pass through the fire and into victory. All Martinez’ instincts protested against this scenario. Though he had every reason to believe that Kreeku would be annihilated, he would probably take at least half of Faqforce with him. The whole scenario reeked of useless waste. There had to be some way to make better use of the loyalists’ advantages. And of what, Martinez asked himself with full, careful deliberation, did these advantages consist? Numbers and firepower . Eight frigates and light cruisers in Martinez’ Light Squadron Fourteen, plus Do-faq’s eight heavy cruisers, against ten heavy cruisers. An advantage sufficient to crush the enemy, but not decisive enough to avoid casualties. Surprise. The enemy wouldn’t know of Martinez’ arrival for another four hours. But that advantage wasn’t decisive, either, because it would take the opposite forces a lot more than four hours to engage. Another surprise. Because the enemy didn’t need to know of Do-faq’s squadron at all. Martinez’ pulse thundered in his ears. He called up a calculator and began punching in numbers. In order for Corona’s world-shattering weaponry to be deployed, three out of its four most senior officers had to turn their keys at the same moment. Martinez feared he’d already lost too much time. He was currently carrying his captain’s key on an elastic band around his neck. He yanked off his helmet– blind, since he was still in virtual– and scrabbled for his collar buttons. He told the computer to cut the virtual environment, then yanked the key, shaped like a narrow playing card, from his tunic and thrust it into the slot on the display. From his position he could see Vonderheydte’s weapons board suddenly blaze with light. “Rotating ship, lord elcap.” Martinez’ cage gave a shimmering whine as the ship rolled. “Display: go virtual.” Again the virtual cosmos sprang into existence in Martinez’ mind. With his gloved hands he manipulated the display controls to mark out three targets in empty space between his squadron and the enemy. The missiles had been hurled into space on gauss rails– there was no detectable recoil, of course– and then rockets would take them to a safe distance from Corona, where their antimatter engines would ignite. Martinez’ mind whirled as he tried to shift from the virtual world, with its icon-planets and plotted trajectories and rigorous calculations, to the officer who wished to talk to him. “I’ll take it,” he said, and then Kamarullah’s face materialized in the virtual display, and at offensively close range. Martinez couldn’t keep himself from wincing. “This is Martinez,” he said. Kamarullah’s square face was ruddy, and Martinez wondered if it was the result of some internal passion that had flushed his skin, or an artifact of transmission. “Main missile engines ignited,” Vonderheydte reported, as if to punctuate Kamarullah’s question. “The missiles– ” Martinez began. Martinez cut off communication, then pounded with an angry fist on the arm of his couch. He told the computer to save the conversation in memory– there had better, he realized, be a record of this. And then he stared blindly out into the virtual planetary system, the little abstract symbols in their perfect, ordered universe, and tried to puzzle out what he should do next. Again Martinez waited for the light to blink, a little glowing planet that came into existence in the virtual universe, and he said, “Lord Commander Do-faq. In my estimation, our great advantage in the upcoming battle is that the enemy do not yet know of the existence of your squadron. As we approach the enemy, I will fire missiles in an attempt to screen your force for as long as possible. I will order Light Squadron Fourteen into a series of plausible maneuvers in order to justify the existence of the screen. He looked at the camera and realized that he should perhaps soften the effect of having just given an order to an officer several grades superior in rank. He fell silent as the recording light vanished from the virtual display, and as he thought of the message flying from Corona to Do-faq through the power of communications lasers, a deep suspicion began to creep across his mind. He began to wonder what might happen if his messages to D-faq weren’t getting through. If, somehow, the wormhole relay stations were under the control of the enemy. The only thing that made his suspicions at all plausible was that the arrival of the Naxid squadron shouldn’t have been a surprise. The station on the far side of Wormhole Two should have seen the Naxids coming hours ago, and reported to the commander of Hone-bar’s ring station, who in turn should have relayed the information to Do-faq, whose arrival he’d known for the better part of a month. In fact, there should have been a long chain of sightings, all the way from Comador. Why hadn’t the information reached him? he wondered. Had half the Exploration Service joined the rebels? If it had, and if his messages to Do-faq hadn’t got through, he’d better order that his last two messages be beamed just this side of the wormhole, so that Do-faq would receive them as he flashed into the Hone-bar system. “Acknowledge,” Martinez said automatically, while panic flashed along his nerves. Do-faq’s order was in response to his first message, and would send Martinez’ squadron on a wide trajectory around the Soq gas giant, wide enough to permit Do-faq’s ships to take an inside track, closer to the planet, to make up some of the distance between the two squadrons. The order was perfectly orthodox and sensible. Unfortunately it wasn’t compatible with the plan of the battle as Martinez had mapped it out in his mind. It would take nearly five minutes for the last transmission, with its suggestion for maneuver on the part of Do-faq, and another five minutes for Do-faq’s response to come back. But in order for Light Squadron Fourteen to embark on Martinez’ plan, it would have to begin its maneuver before Do-faq’s reply could possibly arrive. In order for Martinez to continue with the plan that he had devised, he was going to have to disobey Do-faq’s order. Suddenly he wished that the Exploration Service had been corrupted, that the messages hadn’t got through the wormhole stations. Shankaracharya repeated the order and then transmitted it to the squadron. Martinez gave the order also to Corona’s pilot, and the acceleration cages in Command sang in their metallic voices as Eruken swung the frigate nearly through a half-circle, its engines now aimed to begin the massive deceleration that Do-faq had ordered. He watched the chronometer in the corner of the display and watched the numbers the marked the seconds flash past. He thought of Do-faq’s dislike of Kamarullah, who Do-faq blamed for wrecking a maneuver, and how Do-faq’s vengeance had followed Kamarullah over the years and deprived him of command. How much in the way of retribution could Martinez expect if he disobeyed Do-faq during an actual battle? And yet, within the ten-minute lag, it was very possible that Do-faq would countermand his own order, and agree to Martinez’ plan. Brilliant light flared on the virtual display. Solid flakes of antihydrogen, suspended by static electricity in etched silicon chips so tiny they flowed like a fluid, had just been caught by the compression wave of a small amount of conventional explosive in the nose of each of the three missiles Martinez had launched. The resulting antimatter explosion dwarfed the conventional trigger by a factor of billions. Erupting outward, the hot shreds of matter encountered the missiles’ tungsten jackets and created three expanding, overlapping spheres of plasma between Light Squadron Fourteen and the enemy ships, screens impenetrable to any enemy radar. The screen would hide any number of maneuvers on the part of Martinez’ force. The plasma would also screen the arrival of Do-faq’s eight heavy cruisers. The sight of the explosions made up Martinez’ mind, and words seemed to fly to his lips without his conscious order. Mentally he clung to a modest justification: Light Squadron Fourteen was not technically a part of Faqforce any longer; Martinez’ squadron command was theoretically independent until Do-faq actually entered the Hone-bar system . . .
None of that, however, would make the slightest difference to Martinez’ career if Do-faq chose to inflict vengeance on his junior.